Francois Fournier is a troubled ten-year-old who has been in foster care since his mother gave up on him when he was four. We don't know much about where he came from. Apparently his father was a miner, and from the one time Francois shares a memory of her, his mother sounds as if she is mentally ill. He has been listed as being in "temporary placement," ever since, meaning that his parents can come back for him any time. They never do. They barely even write. This is the stage for French director Maurice Pialat's 1968 full-length debut, L'enfance nue (Naked Childhood). First-time actor Michel Terrazon plays Francois, a blank slate who says little, but does much. Though he is sweet deep down, Francois has a habit of acting out. He likes destroying things. We see him smash a watch and flush it down the toilet for no reason (he may have also stolen it). He drops his foster sister's cat down a stairwell just to show off. Is it any wonder that his current caretakers, Simone and Robby (Linda Gutemberg and Raoul Billerey), have had all they can stand? So, Francois is bundled off to another family, an older couple named Thierry who have him call them Grandma and Grandpa (Marie-Louise and Rene Thierry). This is the second marriage for both of them, they both have kids from their previous unions, but since they were too old to have any together, they started taking in abandoned children. They are also caring for a very young girl and a high-school boy named Raoul (Henri Puff). Plus, Mrs. Thierry's mother (Marie Marc) lives with them. We know all of these things about the Thierries because they tell Francois. All of them, including old Nana, aren't afraid to share their lives with this new house guest. Grandpa shows him photos from the war and medals he got fighting in the Resistance. Nana reads the funnies with him and tells him what words like "mistress" mean. Raoul gets him to open up briefly, but that's it. We end up knowing very little about Francois. His is a life we observe, we are not privy to what is inside him. This is for a very good reason. 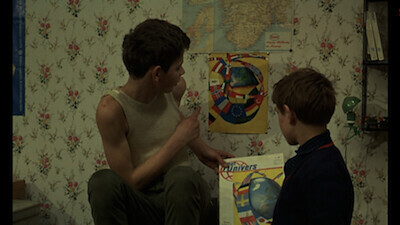 L'enfance nue only gives us as much insight into Francois as he has in himself. 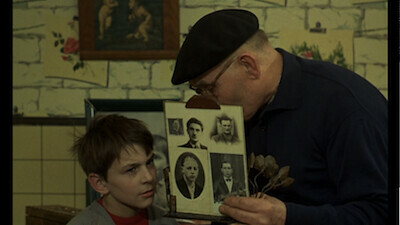 Pialat has his young actor play the boy blankly because the character doesn't seem to know why he does what he does. Sometimes it's for fun, we might see him laugh or smirk, but other times, it appears to be habit and, often, impulse. 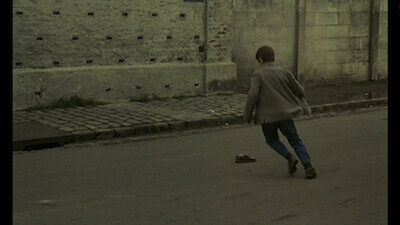 In one scene, we watch him kick his shoe up the street, spot a storm drain, and then punt the shoe down it. Once it's gone, his demeanor immediately shifts. He did it deliberately, but he didn't consider what he would do once it was underground and in the muck. It's the kind of reaction someone has when they have issues with anger. In a rage, they punch the wall, and the pain and damage to the wall shocks them out of their fury; only here, it's something small and quiet yielding the same results. The script for L'enfance nue is by Pialat and his regular collaborator Arlette Langman (they also made Loulou and À nos amours). It has the illusion of being formless and would likely drive a screenwriting teacher mad. Where is the inciting incident? Where is the third act obstacle? What is the character's goal? 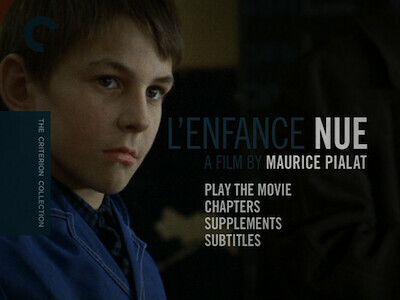 L'enfance nue was produced by Francois Truffaut, and there are inevitable comparisons to be drawn to The 400 Blows, as both films are about young boys whose restlessness is going to get them into trouble. 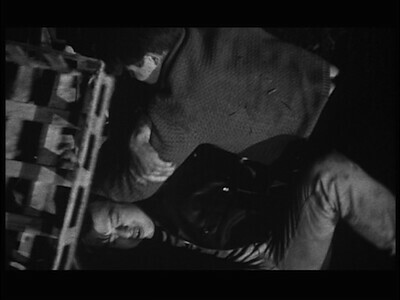 The two are different in a very obvious way, however; Truffaut's protagonist, Antoine Doinel, wants to take control of his restlessness. He is a bundle of kinetic energy, always acting, always pushing forward. Francois doesn't have that control. He is a ward of the state, subject to what social services dictates for him. He has no concept of being in charge, and his rebellion is limited to the confined space where they've exiled him. Like a prisoner, he does something, then drops the evidence, and waits to see if he's found out by the guards. It's not that he doesn't know how to act properly, either. He gives the first foster mother a gift when she sends him away, and he bonds with Nana, I just don't think he sees much benefit in maintaining. Not as long as he's "temporary." And so L'enfance nue adopts this quasi-state. The story progresses, but almost imperceptibly. Change is identified by behavior, but Pialat never has anyone point it out. The most important development in Francois' personality is when, feeling guilty about stealing from Nana, he slips her coin purse back where he found it. (Though, a cynic might say he knew there was no way he would not get caught.) There is no epiphany that leads him to this, just as there is no a-ha moment to set the stage for the end. Things are what they are. Just watch. The act of watching is rewarded in ways that exist beyond what is gathered from the story. 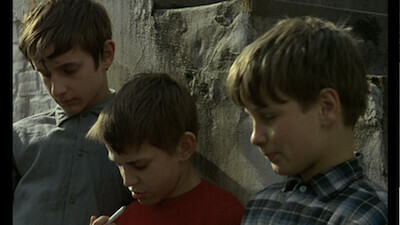 L'enfance nue was shot by Claude Beausoleil, who also photographed Agnes Varda's Le bonheur [review]. Though L'enfance nue doesn't quite have the pastel color palette of the Varda film, which often looked like the characters were living in a magazine advert, Beausoleil still pays attention to the colors here. Walls tend to be painted in medicinal hues, like hospital-scrubs blue and toothpaste green. Most surfaces are flat, patterns only show up in the more inviting Thierry home, and the film has a sickly yellow tint that, though controversial, gives the version on this DVD L'enfance nue an unhealthy pallor and creates an overall aura of poverty. It's not quite Neorealism, but it's not exactly a Technicolor wonderland, either. At the same time, the construction of the screenplay is like Neorealism. Pialat had been making short documentaries prior to L'enfance nue and his loose narrative owes more to that prior work experience than it does the Nouvelle Vague. As I said, this is a chronicle of a life observed, and so it's Pialat's intention to just hang back and let things happen. He doesn't enhance the emotions with music, nor does he write any big speeches for his characters. The script doesn't hand anything to the viewer or explain itself. You could conceivably sit through all of L'enfance nue and walk away empty handed. It's almost like a social experiment in that way. Are you someone who sees a displaced little boy like Francois and feels nothing, or are you someone who can become engrossed in another's sadness? L'enfance nue is a movie that requires empathy, not sympathy, and knowing the difference between the two is really all the difference in how it affects you. That kind of empathy can also be found in Pialat's 1960 documentary short L'amour existe (Love Exists), included here as a thematic precursor to L'enfance nue. In this 20-minute piece, Pialat shows us the various states of life in the areas outside of Paris, including the suburbs, tenements, and shanty towns where the working class and the poor live. In voiceover, the filmmaker laments the dwindling quality of life for the displaced, and questions where it leaves young and old alike. There is a scene of brawling juvenile delinquents where the violence exists in some weird zone between unbridled aggression and play--so much so, it almost looks staged. Watching L'amour existe now inspires conflicted reactions. While the effort is certainly sincere, at times the narration has a superior tone that makes the social message a little more puzzling, and the black-and-white photography has a tendency to romanticize the scenery. This latter problem is one that Pialat must have been aware of and is possibly using for effect. The final shots of the piece, where he shows how a simple change of camera position can change the Hand of Glory into a panhandler, remind us that cinema is about point of view. It's all about position of the seat you're watching from. Additional bonus features continue to highlight the parallels between the fiction of L'enfance nue and the reality it draws from. Autour de "L'efnance nue" is a 1968 program from French television that chronicles Pialat's production and uses it as impetus for investigating the country's foster care system. There is also a 1973 interview with Pialat, a 2003 piece with Arlette Langmann and assistant director Patrick Grandperret, and a new video essay by Kent Jones.